Introducing our first male pin carrier, utilizing thin Kapton film to create ultra-low-profile interconnects. Overall connector height and size are greatly reduced making it ideal for locations where traditional insulator housings can’t be accommodated. This initial offering is a perfect solution for low profile board to board connections. The new 3169-0-61-15-00-00-03-0 product features a double tail PCB pin mounted in .005” thick Kapton film/tape. The Kapton can be easily removed after soldering but if left in place does not add to the interconnect height of only .030” (,762 mm). The pins are spaced at .100” (2,54 mm) pitch, allowing for multiple pins to be assembled onto the circuit board at once; making low volume, manual assembly more efficient. Kapton film/tape is a high temperature polyimide material making it suitable for all soldering processes. 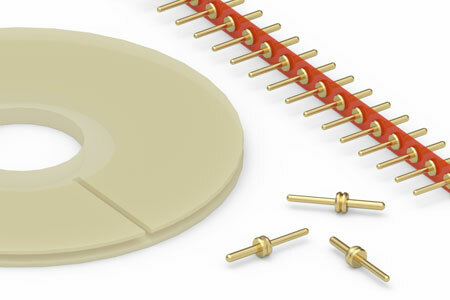 These PCB pins are precision turned from Brass alloy and are plated with 10 u” gold providing interconnect reliability, corrosion protection and wear resistance. The packaging is a continuous strip spool of 1,000 pins, which the user can easily cut into strips of the desired number of pins. For lower quantities and packaging specifics, please contact an authorized Mill-Max distributor or if the 3169 style pin does not fit your requirements, contact out technical services department to discuss your needs.